Thanks to our funding sources, Monarch Watch and our partner nurseries were able to distribute over 104,000 free milkweeds for restoration in 2018. Since the program began in the Fall of 2015, we have distributed almost 425,000 milkweeds! We also owe a big thank you to everyone who has worked so hard to plant and care for these milkweeds. The Spring 2019 application is now open for habitat restoration projects located in the Monarch Milkweed Corridor. This includes most of the eastern half of the United States. Florida, Alabama, Mississippi, and Louisiana are not included in the grant at this time. Only certain portions of Arkansas, North Carolina, South Carolina, and Georgia are included. As of 1 September 2018, Monarch Watch has secured funding for 100,000 more free milkweeds for restoration. We are actively seeking more funding sources. If funding and seed become available for more areas, the application will be updated accordingly. Through a grant from the Natural Resources Defense Council (NRDC), over 80,000 free milkweeds for restoration projects were distributed in 2016 by Monarch Watch and our partner nurseries, leaving just under 20,000 to distribute Spring 2017. Monarch Watch uses 22.3% for administrative costs and 77.7% to pay the nurseries for the plants. Since Fall 2015, over 300,000 free milkweeds have been distributed by Monarch Watch and our partner nurseries for habitat restoration projects, thanks to a grant from Monsanto. The grant has been renewed for 2019 under the company’s new name, Bayer. Bayer pays the nurseries directly for the plants and Monarch Watch receives 21.8% of the grant for administrative costs. For more information on the company’s monarch program please visit: Epic Efforts Taking Wing for Monarch Butterflies. Several anonymous sources provide funding for free milkweeds for restoration. Free milkweeds are for large-scale (two acres or more) native habitat restoration only. Habitat restoration is defined as the practice of renewing and restoring degraded, damaged, or destroyed ecosystems and habitats. Gardens or landscaped areas do not qualify as restoration and are not included in this grant. The portion of property where milkweed will be planted must be a minimum of two acres in area. Roadsides and Trails are acceptable areas. Our recommendation for ideal monarch habitat is planting milkweed in patches of 3-4 plants, 10-13 patches per acre. Applicants must demonstrate that they have a land management plan, and that other nectar sources are either pre-existing or are included in the project. We recommend against planting large quantities of milkweed in a small area. We cannot guarantee that we will be able to provide all species listed. Monarch Watch reserves the right to determine whether an applicant qualifies for free milkweed, based on the restrictions placed by the funding sources. Recipients will be notified by email mid-March to mid-April, depending on their location. The award email will include an invoice for shipping and handling charges, planting instructions, and other helpful information. Shipping will begin when the plants are mature enough for shipping. Shipping dates are dependent upon many variables, but usually begin around the end of April or beginning of May. Milkweed plugs are propagated in two types of flats, either 32-cell flats with a shallow well or 50-cell flats with a deep well. The minimum award is four flats. The amount of the award is dependent on funding, supply and demand, and our goal to distribute milkweeds widely across the entire Monarch Milkweed Corridor. Recipients should consider the time and effort it takes to plant and provide initial care for large numbers of seedlings, including watering. Requests for more than 2,000 plants will be considered on a case-by-case basis. Recipients will be responsible for shipping and handling costs, which are modest compared the value of the plants. For most shipments, four flats cost $40-$60 to ship via UPS Ground, (20-30 cents per plant). Freight charges for pallets vary by carrier and distance travelled, but are usually in line with the UPS rates. Orders will be shipped UPS Ground on Monday or Tuesday, in order to arrive before the weekend. Large quantities (2,000+ plants) will be palletized and shipped via freight or on racks in nursery trucks. A dock and pallet jack or forklift will need to be available at the delivery address. Please read the guidelines above before proceeding to the 2019 Free Milkweed Application. 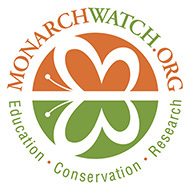 If you wish to donate a monetary amount to Monarch Watch, please visit Donate to Monarch Watch. Monarch Watch uses donated and purchased milkweed seed. If you wish to donate seed collected from wild populations of milkweed, see Seed Collecting and Donating. Monarch Watch is a nonprofit educational outreach program based at the University of Kansas that focuses on the monarch butterfly, its habitat, and its spectacular fall migration. 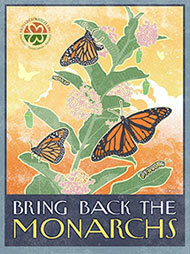 "Bring Back The Monarchs" created by Monarch Watch and funded by Monarch Watch and the Monarch Joint Venture.